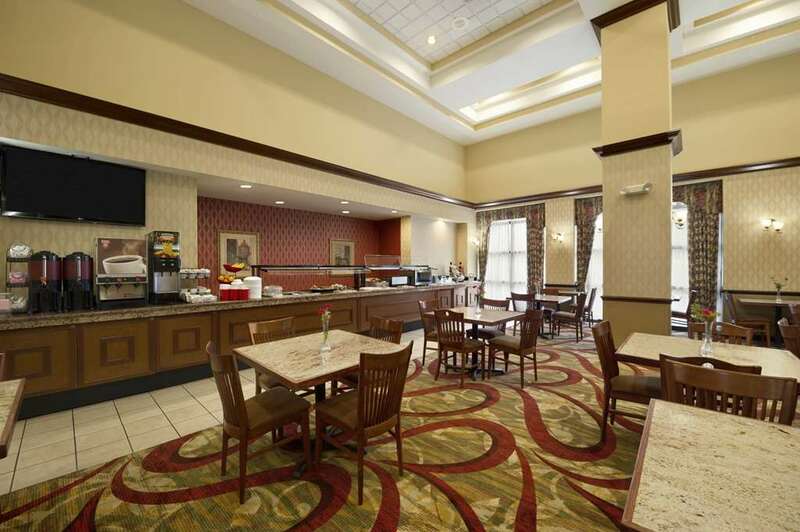 The Ramada Suites Orlando Airport is conveniently located just 5 minutes from Orlando International Airport MCO. The Ramada Suites Orlando Airport is the closest location to Lake Nona, the Medical City, Burnham Institute, and UCF Medical Facility. Just a 20 minute drive time to Walt Disney World, Sea World, Universal Orlando and 40 minutes to Port Canaveral. Your stay begins with recently upgraded two room suites with new Simmons Pillow top Beds, agronomical work space, and free wireless high speed internet. Suites are equipped with a separate kitchenette with microwave and refrigerator, and living area includes some sleeper sofas. Each morning enjoy a free breakfast including scrambled eggs, sausage, Belgian waffles, fresh fruit, cereals, and hot coffee. Our all-suite hotel also provides meeting space accommodations for up to 70 people. Other amenities include Outdoor swimming pool, fitness center, business center and Ramada Convenience Mart as standard amenities. Shuttle transportation to and from Airport from 430 AM to Midnight. Non Smoking Hotel.